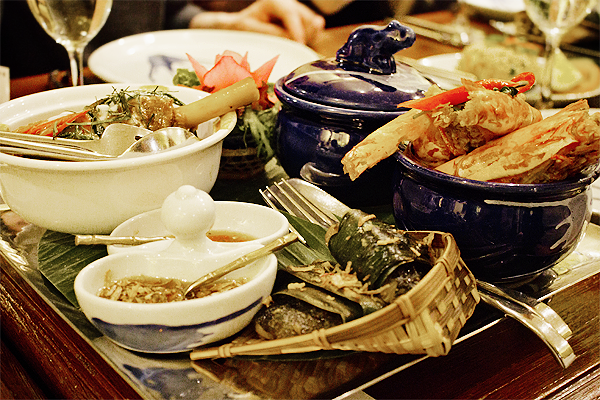 Thanks to nine months of living in (and eating through) Bangkok I have become one of London’s pickiest Thai foodies. Don’t get me wrong, I taste and trial at every opportunistic corner of The LDN but sadly find that little compares to authentic Thai food. 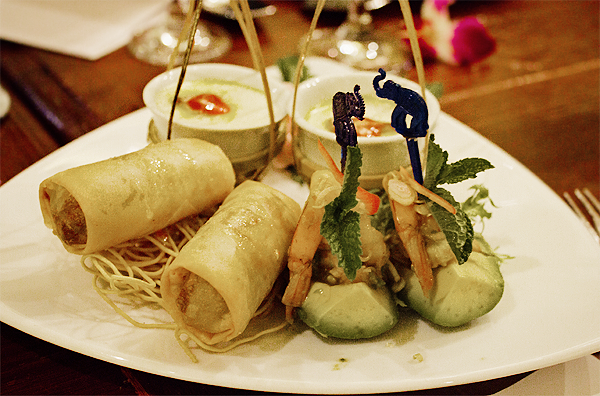 Personally, a visit to Blue Elephant was the Ultimate Thai Test. Now open for over 25 years (having recently located from Fulham Broadway to a beautiful riverside spot at Imperial Wharf), many people consider Blue Elephant to be London’s go-to for excellent Thai food. After previewing and gorging my way through their Valentine’s Day menu, I now feel the same. 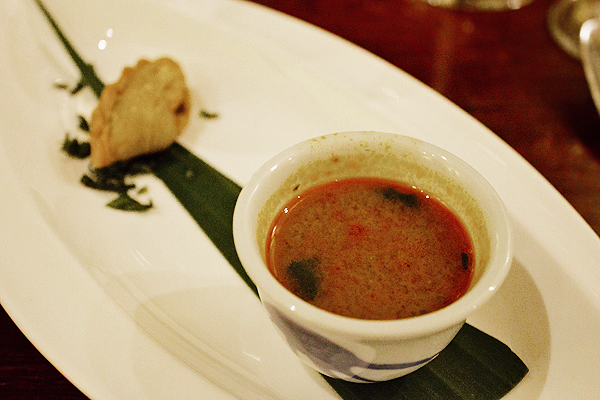 Nestled in an exotic Thai-themed room of Asian antiques and objets d’art, we were first presented with a zakuski of Tom Yam Koong soup with tiger prawns and a flavorful hit of dong quai alongside a small sampling of Chef U-La’s homemade green-curry and vegetable-stuffed pastry. The familiar sour spice mingled beautifully with the herbal pastry and was right on par with every Tom Yam dish I sampled in the Thai capital. 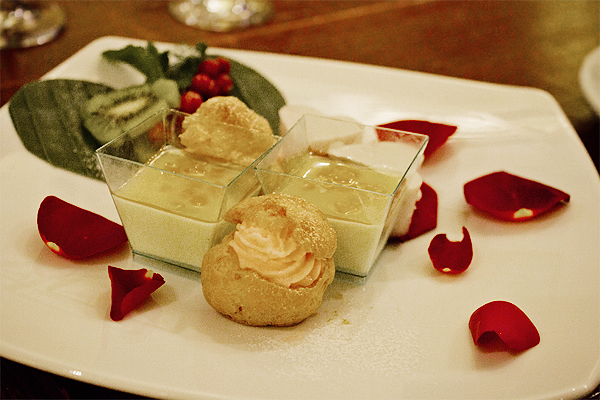 As a Valentine’s menu, both the starters and mains are perfectly paired for two. As well as a surprisingly sumptuous steamed egg custard with foie gras (topped with homemade strawberry sauce), the large range of starters included deep-fried duck, black mushroom and celeriac spring rolls, steamed floral-shaped dumplings stuffed with minced free-range chicken and aromatic herbs “Chor Chom-Pu Black Chicken”, as well as a ‘Plah Koong’ avocado salad with prawns, lemongrass, coriander, mint and kafir lime leaves wish I would happily eat every day of my life. 1) A rich spicy lamb shank curry with black wild ginger (apparently known for it aphrodisiac properties). 3) “Love Drunken Prawns” so large you could keep them as pets. The stir-fried dish featured a homemade paste of bird’s eye chilies, shrimp paste, black wild ginger, kaffir lime, sweet basil leaves and a hint of rice whisky, culminating in my favourite dish of the evening. By the time dessert arrives, you will be more than happy to split the heart-shaped treats in two. Their Panna Cotta – flavured with Royal Jelly and vanilla pods from The Royal Project Farm – was the only thing I was able to polish, but the eclairs (filled with rose-flavored cream) and young coconut jellies proved to be popular among my dining companions. If you are interested in a spicy evening this 14th I highly recommend this £69.00 per person menu (with vegetarian options available).